While I'm a technology entusiast, wasteful tech applications makes me wonder if we've actually passed the edge of intelligent evolution and going straight downward in the human parabole. This is a primary example. The classic soap dispenser: just press the top and you'll get your drop of cleansing solution. The waste is reduced to the small plastic envelope that contained the soap, every thousand or so dispensing. Enter the evolution of the species: the electronic dispenser. 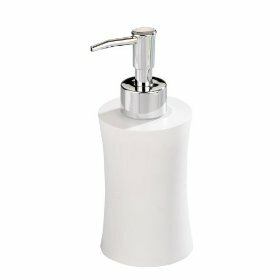 It has a proximity sensor that senses your hands and sprays the soap while passing them under. Now you have some electronics instead of just a mechanical pump and a couple of batteries to make them work. The waste is increased to the rigid plastic soap cartridge and the batteries themselves. Even if you are using rechargeable batteries, you're actually using some more energy to recharge them once in a while. Note that the dispenser itself is priced lower than a mechanical counterpart. The manufacturer is probably using the printer/cartridge business model: selling the dispenser under cost while earning on the soap cartridge. It won't surprise me if the cartridge has some anti-recharging/anti-counterfaiting device in place. Someone may say that this is increasing igiene: you don't have to touch something the everyone has touched. I'm also expecting the same company to develop something to avoid touching door handles and all other not-so-glamorous stuff you had to touch in a toilet: the soap dispenser seems to be the last of my problems.